On the corner of Marlborough Rd and Old Farm Rd is a group of detached houses built in the 1970s. They stand on the site of what was originally Newhouse Farm. Newhouse Farm was first mentioned in 1593 in a survey of John Newdigate’s estate. At that time it was the only building in the north-west area of Hampton, lying east of the track ridden by Wolsey and King Henry VIII on their way to Hanworth Palace – a track that is now Broad Lane and Oak Avenue. William Gresham owned the house in the 1620s, his widow surrendering it and 53 acres to Lord Cottingham, a supporter of the King in the Civil War. The house, rented by Charles II in the 1665 plague but unused by him, is recorded in the Hearth Tax assessments of that time. Later called Chalk Farm it was bought by James Campbell of the Argyll family including 250 acres of narrow strip land that were to be ‘modernised’ by the 1811 Enclosure Act. In 1863 the farm, by now Tangley Park, was advertised for sale by auction: the catalogue drew attention to ‘its eligibility for building, accommodation or market gardening purposes’. A Mr Grover took it over in around 1866, selling in 1867 to Arthur Stanford who had grandiose ideas for development. He in turn sold in 1883 to the Estates Investment and Villa Farm Company. The quarter acre plots sold slowly, some becoming market gardens. From the late 1880s onwards a number of market gardens or nurseries began to appear on what had been farmland in the area of Tangley Park, particularly between Buckingham Rd and the Hanworth border. This was an inevitable consequence of the growth of London and its need for fresh produce and the increase in building that pushed the boundaries of built-up London ever westward. 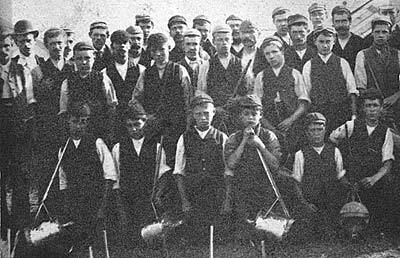 Many of the nurserymen were from Germany, Holland and Belgium. In 1890 the Villa Farm Company was liquidated and the Marling family took over; the farmhouse became a private house, ‘The Old Farm’. 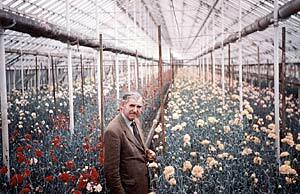 The nurseries remained highly successful up to and including the Second World War and into the 1950s, but increasingly competition from Holland and the ability for suppliers to import produce by airfreight made them increasingly less profitable. 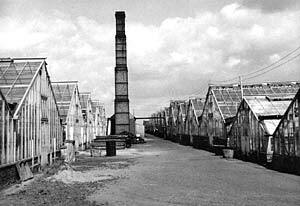 The nurserymen began to give up their businesses. In October 1957 a planning application was made to develop the nurserylands, now part of London’s Green Belt, on the grounds that the land had ‘gone sour’. New Ideal Homesteads applied to build on behalf of the Triangle Growers Association, attempting to change the status of the Green Belt to residential land. The application was refused, as were applications in 1960, 1963 and 1966. By 1972, when most of the nurserymen had given up, the government announced that 1000 acres of London’s Green Belt could be released for housing. Sterling Homes put forward plans and when the GLC threatened to purchase the area the Council modified its opposition. Hampton Residents’ Association, realising that change was imminent proposed the retention of open space and community uses. An upper limit of 1100 units was set and several rural features, a green opposite All Saints’ Church and the Church bungalow were kept and a plan to close Oak Avenue was prevented. Building of what is now known as The Nurserylands began. The area became a two councillor ward in 1978 and the 270 bus appeared on the streets. 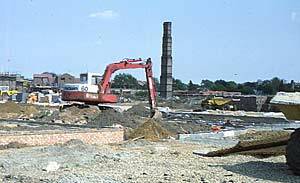 On 13th February 1981 the Queen visited to inspect the two millionth NHBC house that was part of the new development. The last owner of The Old Farm was Mrs Day, widow of Dr Day, and in the 1960s she obtained permission to demolish first the house and later the barn – which after four centuries saw out its days as a room for dancing classes. At the time the nature of the development of the Nurserylands was settled in the 1970s, it was clearly understood that of the total area of 140 acres some 60 odd acres of open space would be retained for public use for the indefinite future, and that part of this land would be allotted for use by Rectory School (later Hampton Community College). The whole area was commonly called Buckingham Fields. 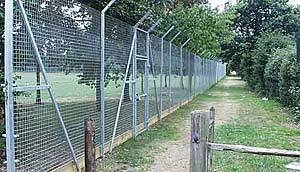 In June 2005, to universal astonishment and disapproval, the Council erected a 3 metre high fence topped with barbed wire on a plot of land adjoining Buckingham Road and declared that this was a dedicated sports field for Hampton Community College. This was vigorously opposed on the grounds that there had been no effective consultation of the community, that the fence was of quite remarkable ugliness, that its erection, clumsily carried out, had involved the destruction of a hedge used by nesting birds, and that the land fenced was not even part of the area set aside for HCC use. The Council remained adamant in the face of fierce criticism but eventually, some 17 months after the fence was erected, agreed in principle that it should be removed. Whilst the dispute remained unresolved, local residents had taken the initiative and applied for the whole of Buckingham Fields, some 60 acres in extent, to be registered as a village green. This application, supported by The Hampton Society (which had also backed the campaign to have the fence removed), came before the Council’s Regulatory Committee in November 2006 and was approved by a large majority, despite the opposition of council officers. Hampton thus has a new village green or common, and negotiations are under way as to how it should be managed for the benefit of the community, including the students of Hampton Community College.